Steve Lucas challenged you again to identify this aerial of a section of the Long Island right-of-way. Glen Oaks Village in Queens, looking northeast. Union Turnpike- diagonally on the bottom. Shiloh Avenue- south of the Motor Parkway on the right. The remains (embankments and abutments) of the the Little Neck Parkway Motor Parkway Bridge. Glen Oaks Village residential housing development built in 1947. It was originally built as rental apartments but converted to co-ops under noneviction plans in the 1980s. 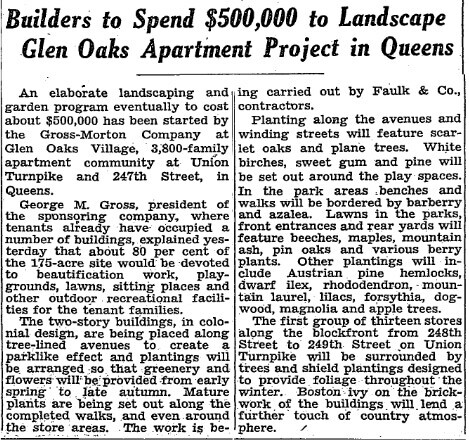 Glen Oaks Village is New York City's largest co-op development with 2,904 garden-style apartments. What year was the photo taken? Provide a rationale. 1947. 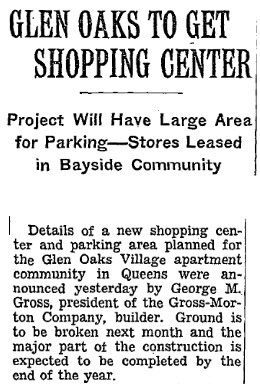 Rationale: The construction of Glen Oaks Village. 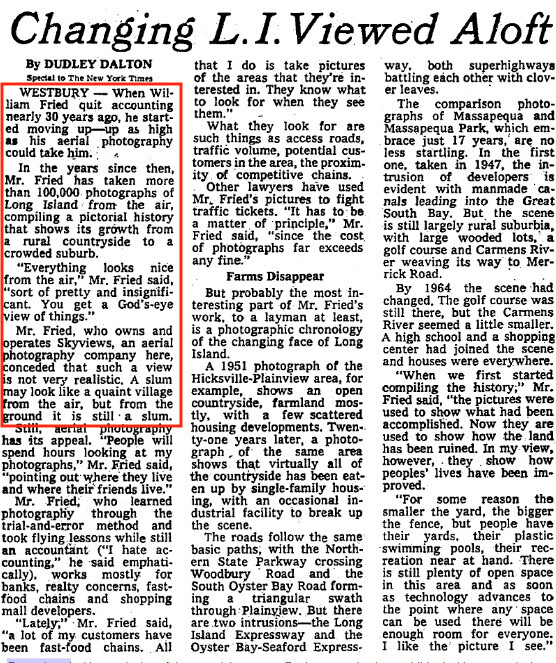 The absence of the roadway on top of the Little Neck Parkway Bridge. Who was the owner of the company that took this aerial? What relevant book did he write? 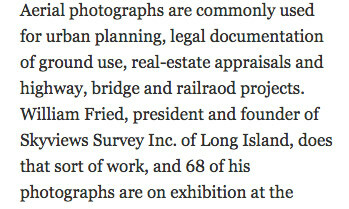 William Fried was the owner of Fried Photo-Aerographics, later becoming Skyviews Survey. 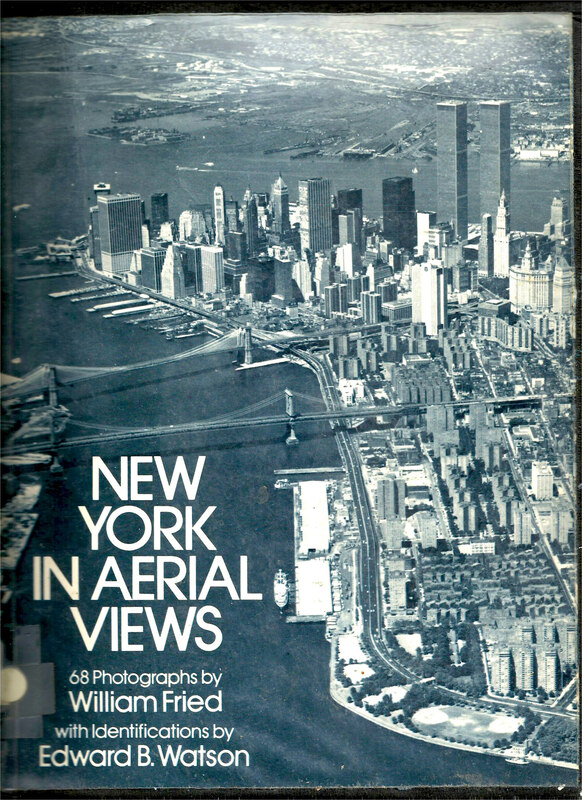 In 1980, William Fried's 68 favorite aerials were published in the book New York in Aerial Views . Aerials from the Skyviews Survey Library are still available for viewing and purchase. Unfortunately, the majority of the aerials are sorted by date not by location. 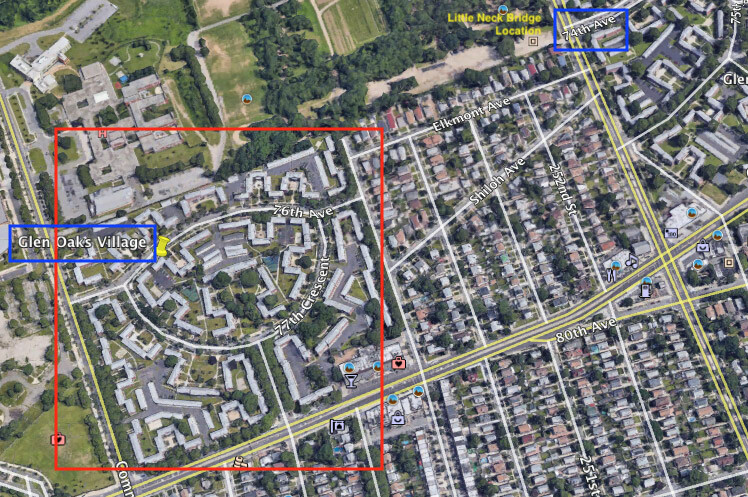 For those with time and patience to look through thousands of aerials in Stamford, Connecticut, here is a link to the contact information. 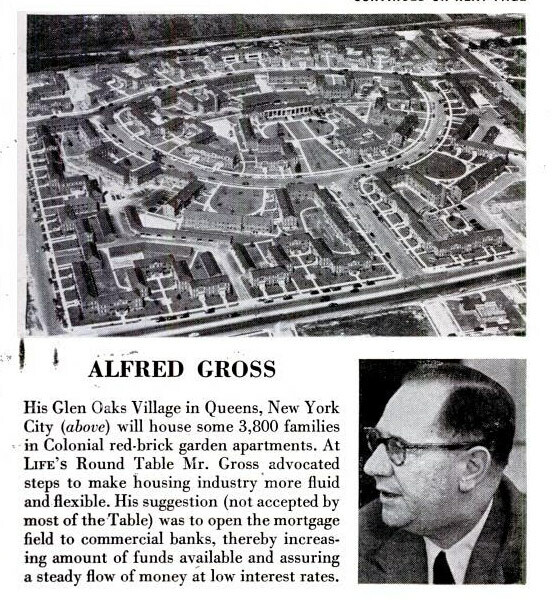 Congrats to Greg O., Tim Ivers, Roy Warner, George Philippides, David Stephan, Frank Femenias (see Femenias Findings), Joe Oesterle, Artie Finnegan, David Kilkenny, Art Kleiner (see Kleiner's Korner), Andy, Gene Perry, Frank Mendyk, Dennis Kelly and Lindsay Bergin for correctly identifying Glen Oaks Village and the Little Neck Motor Pakway Motor Parkway Bridge. 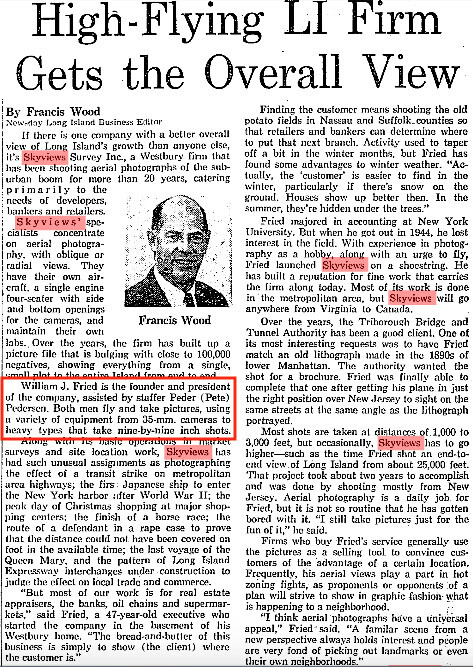 Kudos to David Stephan, Frank Mendyk and Art Kleiner (see Kleiner's Korner) for identifying William Fried as the owner of Fried Photo-Aerographics. Femenias Findings (Submitted by Frank Femenias) ! Frank Femenias: Howard, suprising, not many changes in Glen Oakes over the years. The Queens County Farm has maintained the open fields! -What year was the photo taken? Provide a rationale. I grew up in Fresh Meadows in the ‘50s and early ‘60s. I’m guessing based upon what I remember. 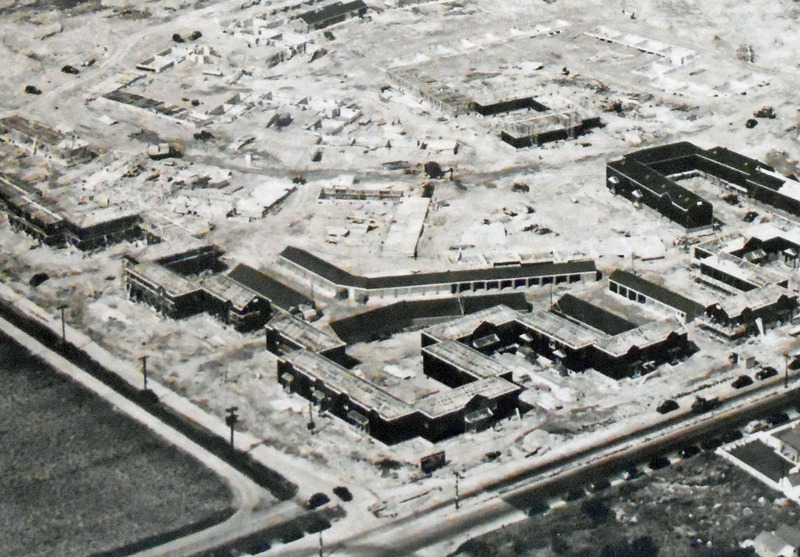 It looks like an aerial view, looking northeast, of what became part of the Glen Oaks Garden Apartments, with the shopping strip fronting on Union Turnpike. 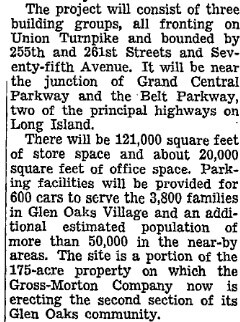 I remember that the remains of the Motor Parkway ran through, and were incorporated into, the Glen Oaks grounds, which can be seen east of the site and running northeasterly. Little Neck Parkway, which is the westerly border of Glen Oaks, is visible. 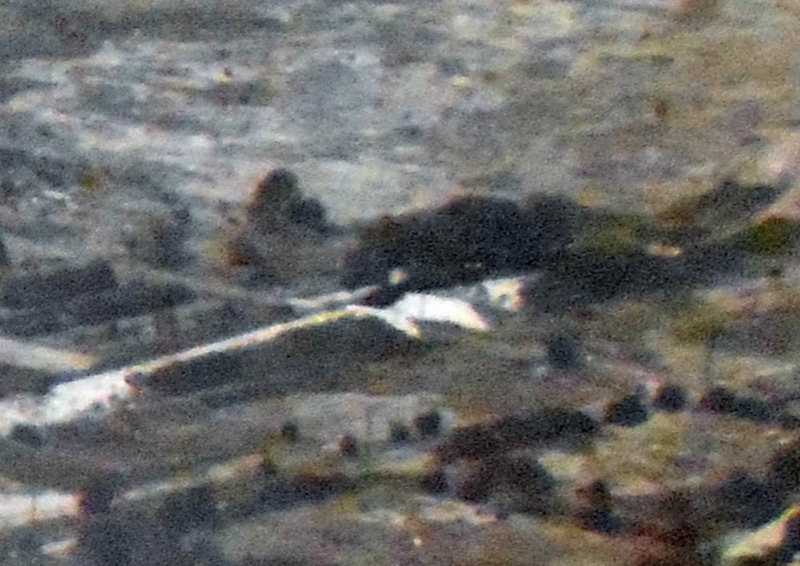 The houses that are south of the site; i.e., on the south side of Union Turnpike, were built after the War (circa 1947-1949). So I think the photo was taken in or about 1948, the year I was born. Photographer is in Queens looking north over Union Turnpike ( horizontal bottom) around Commonwealth Blvd( vertical left) with Motor parkway horizontal top) Motor Parkway Little Neck Parkway Bridge is upper right, just north of Shiloh Ave.
Property under construction is Glen Oaks Village. Year is around 1939-1942 because after LIMP was shut down, they put up concrete barriers to keep people from using road and bridges. Bridge was taken down in 1942. 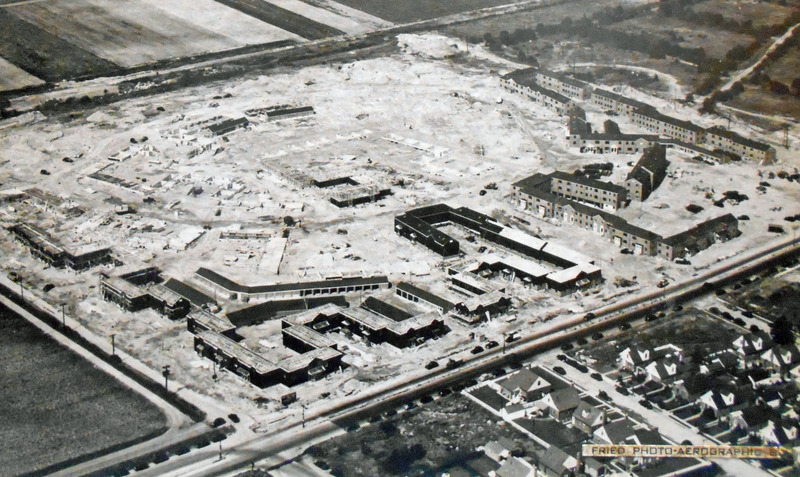 Photograph is looking NNE at the construction of Glen Oaks Village (GOV). Photograph taken somewhere over current-day Cross Island Pkwy, south of Union Tpke, or over the adjacent Creedmoor property. Union is the diagonal road to the bottom and the intersection of Union Tpke and Commonwealth Blvd (once Clinton Ave) is at lower left. LIMP runs diagonally above GOV and near the upper left the remains of the Little Neck Pkwy (Rd.) bridge can be seen. NYC PLUTO database reports that buildings in center of GOV were completed starting in 1948, so picture cannot be after that. Buildings shown as complete were built in 1947 (near Commonwealth and Union). Given foliage, best guess would be late Spring/early Summer 1948. Other details confirm picture must be after July 1942 (bridge demolition) and before 1950 (completion of houses off SE corner of Union & Commonwealth). While not a “major” road, the diagonal-to-the-street-grid path that leaves east side of GOV will (more-or-less) become Shiloh Avenue, connecting with Little Neck Pkwy at the right edge of the photograph. Shiloh was originally mapped to start at Union and drawn to run parallel to act like a south “service road” for the LIMP segment that was just west of the Nassau County border. As built, Shiloh is a stump and was rotated to the south to avoid crossing Little Neck Pkwy at another street. Perhaps another reader knows reason this street was named Shiloh in the first place. 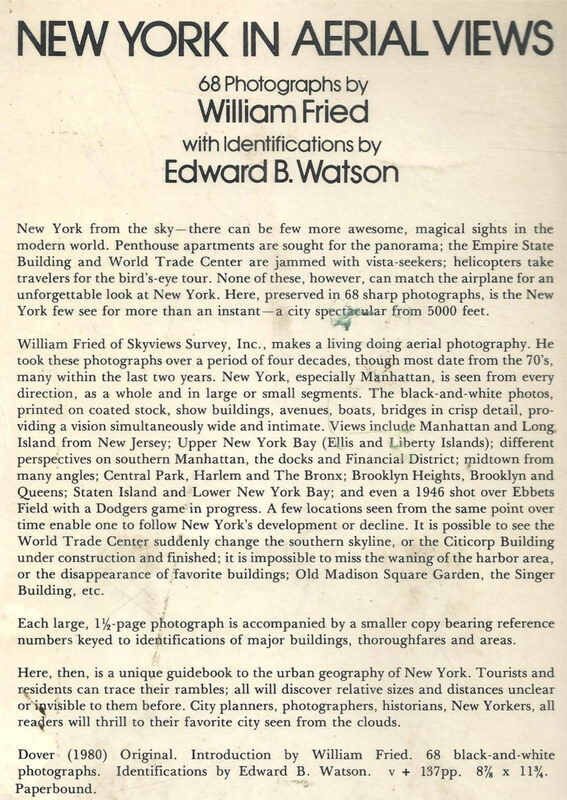 William Fried was the owner and his relevant book (of photographs) is “New York in Aerial Views.” Mystery picture was taken early in his career that continued until 1980. Encourage all to look at that book. Used copies of a reprint edition are easily found online. 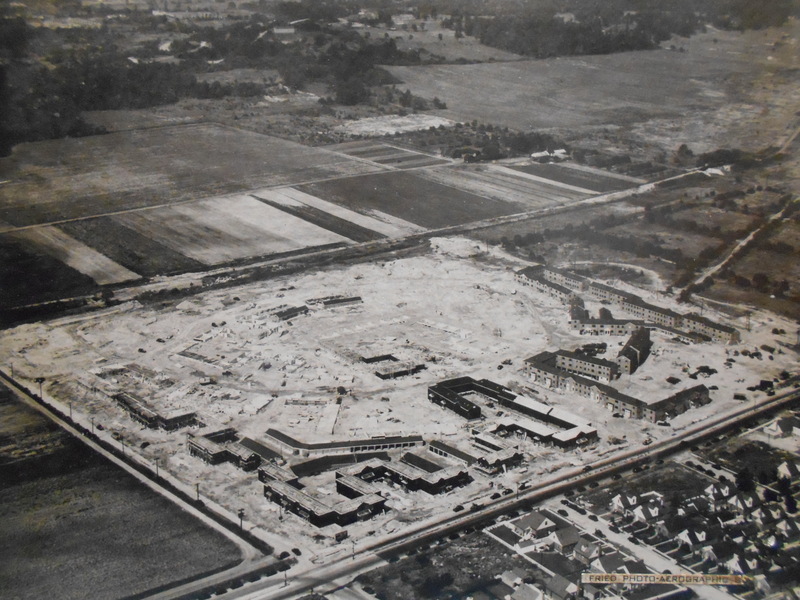 Glen Oaks Village under construction looking NE. Motor Pkwy is diagonal just behind the construction site. Commonwealth Blvd bridge is just out of view on the left but Little Neck Pkwy bridge can be seen at top right. This photo was taken before the Little Neck bridge was taken down by Borough President Burke in ’42, so the parkway may still be open here. Rode my bike through this neighborhood a few times to reach the parkway RoW behind LIJ’s parking lot. Roadways include Union Tpke. Joby’s Motor Parkway East petition is still taking signatures. Commonwealth Blvd & Union Tpke. The LIMP bridge over Littleneck Parkway is mostly there. It appears the walls of the bridge remain, while the steel crossing is gone. So this would put the picture after WW2. This appears to be the beginnings of Glen Oaks Village, shot looking northeast. It is framed by Commonwealth Blvd on the west and Union Tpke to the south. Way off in the distance you can see the Little Neck Parkway bridge. The Comm Blvd bridge is just out of view on the west. I would put this around 45’ or 46’. 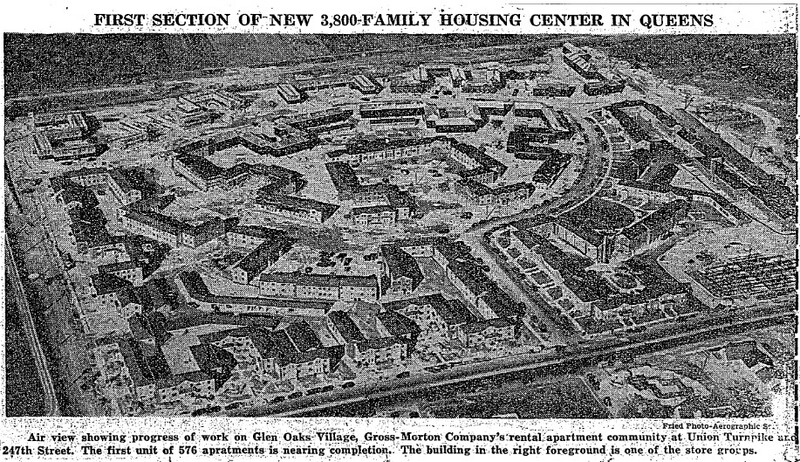 The property under construction: The 3,800 unit Glen Oaks Village built by Alfred Gross in 1947. What year was the photo taken? Provide a rationale. Sept., 1947 (Dec. ‘47 shows it more completed and a previous mystery photo answer). Who was the owner of the company that took this aerial? What relevant book did he write? 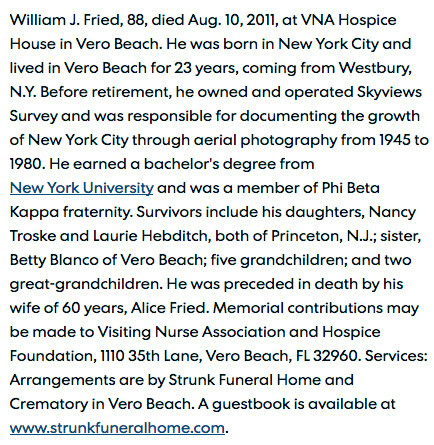 Owner was William Fried, owner of Skyviews. Wrote “New York in Aerial Views: 68 Photographs by William Fried”. Looks like the construction site is Glen Oaks development, north eastern queens. VMP borders the northern side. EST date 1953. Also, just north of glen oaks is Lake Succes Vanderbilt property with gold course. Glen oaks was built in 1948.So I’d say the date of the photo is 1940.I grew up and lived in Glen oaks in the 1950’sto 1980. This is Glen Oaks Village. Built in 1947. The top of the picture is NE. Union TPKE runs east to west at the bottom and Commonwealth runs north to south on the left wide of the picture. Major roads: Union Turnpike (bottom running left to right). Motor parkway is running parallel on the other side of the property. Perpendicular to those on the left side is Commonwealth Blvd and to the right is 249th street.